The model PG43SA-C diaphragm pressure gauge has been specifically designed for the requirements of sanitary applications. 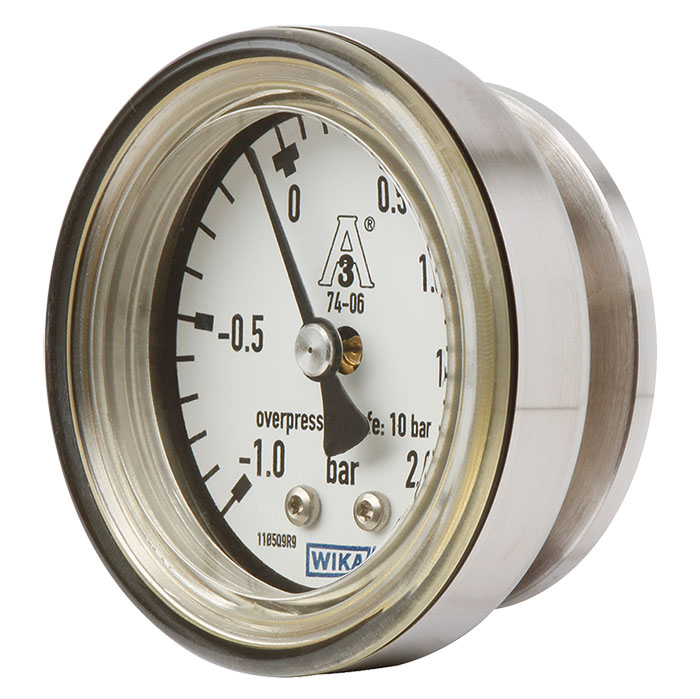 The purely mechanical pressure transmission, using the diaphragm-element measuring principle, and the high overload safety ensure a safe pressure measurement. As a result of the dry measuring cell, the risk of contamination of the product by transmission fluid is eliminated. The flush welded diaphragm element in conjunction with the aseptic process connections (e.g. clamp, threaded, VARIVENT®, BioControl®) enables a dead-space free connection to the process. The very compact and robust PG43SA-C measuring instrument is particularly suited for vertical pipelines, small plants and mobile containers. The patented design with integrated process connection at the back of the case enables space-saving installation. The measuring instrument finds applications, for example, in systems for ultrapure steam generation or as an independent pressure display, without the need for an external power supply, on portable tanks. The PG43SA-C in hygienic design can be used for CIP (cleaning in place) and SIP (sterilisation in place) and in wash-down areas. The measuring instrument can thus be cleaned reliably and time-efficiently. Based on a third party verification, the model PG43SA-C corresponds to the 3-A Sanitary Standard.